Americans like chicken, and they like a lot of it. The high demand for more and cheaper poultry has driven the industry to continue breeding bigger and bigger birds. Full-grown chickens are more than four times bigger than they were 60 years ago, and commercial chicken farms today have more than 800 times more birds. A study published last fall by the Poultry Science Association shows that broiler chickens, birds raised for food, typically weighed just over 900 grams (about two pounds) in 1957. The average broiler today weighs more than nine pounds. New technologies that allowed for better nutrition and disease control, along with breeding birds for certain genetic traits, excessive feeding, and a lack of exercise, allowed the poultry industry to dramatically increase the size of America's chickens, and more specifically the breasts. Most Americans prefer white meat, so chickens are bred with bigger breasts in order to produce more of what the people want. The unwanted dark meat is actually exported, largely to Russia, where dark meat is more favored. Just because Americans are particular about what type of meat they want doesn't mean they're eating less, though; the average American eats more than 80 pounds of chicken each year (that's nine whole chickens), compared to 15 pounds in the early 20th century. To put that in perspective, a typical Labrador Retriever weighs 80 pounds, as does a dishwasher. Chicken is the most commonly eaten animal in America, and it's expected to become the most eaten meat in the world in the next five years. The demand for poultry will continue driving the industry to produce bigger birds until it's physically impossible to breed and fatten up larger chickens. According to PETA, "they are bred and drugged to grow so large so quickly that their legs and organs can’t keep up, making heart attacks, organ failure, and crippling leg deformities common." 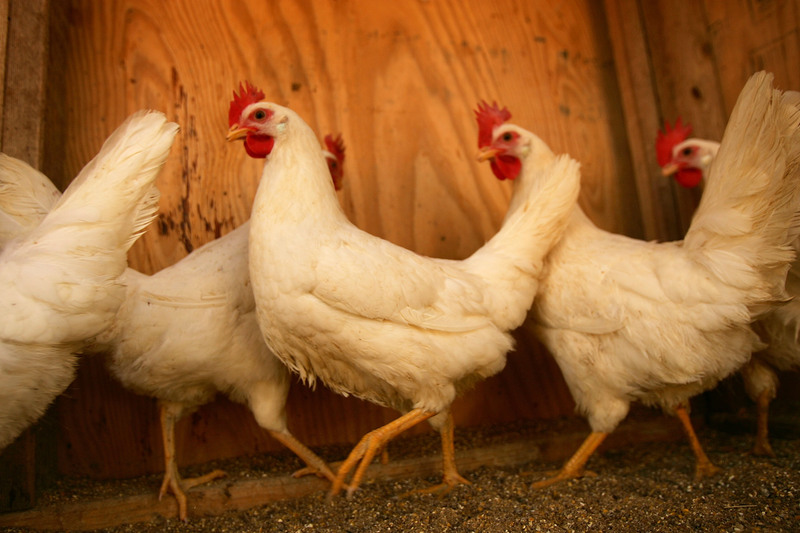 America's love for chicken has already led poultry farms to increase exponentially in size, leading to chickens that live in sheds holding 20,000 chickens or more and never leave their cage. Dietary recommendations that Americans should eat less red meat naturally made poultry the optimal protein for most people, but the trend has already led to the largely inhumane treatment of chickens. If the poultry industry continues down the same path to keep up with demand, who knows how big chickens will be in another 60 years.